This is a custom built cable assembly, made by WORLDS BEST CABLES (WBC). This cable assembly is made using the Mogami 2932 Multi-Core, Ultra-Flexible, Shielded (Copper served shield & a Low Noise Cross-Linked Polyethylene Insulation) wire and Eminence E800 25 Gold-pin Male DB25 connectors. We at WBC always make world-class custom-built cable assemblies using many of the leading cable and connector brands, if you are unable to find the length and type of cable you are looking for, please feel free to contact us, we will strive to assemble the required cable for you. This is a custom built cable assembly, by WORLDS BEST CABLES (WBC). This cable assembly is made using the Mogami 2932 wire and Eminence E800 Connectors. We at WBC always make world-class custom-built cable assemblies using many of the leading cable and connector brands, if you are unable to find the length and type of cable you are looking for, please feel free to contact us, we will strive to assemble the required cable for you. 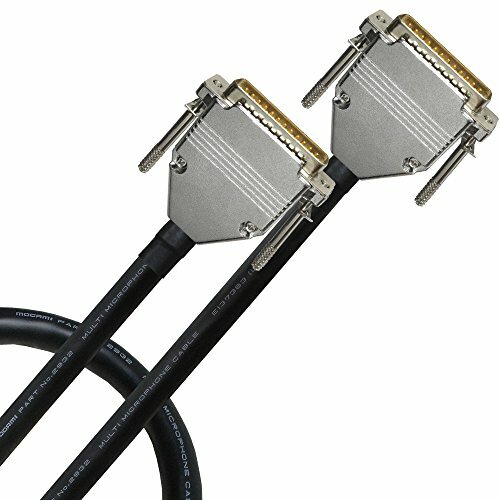 These are custom made cables lovingly assembled by WORLDS BEST CABLES, we offer the largest array of custom built cables in the market, we carry all the major cable and connector brands. We have served millions of customers with quality assemblies for many years - This sale is for a single 3 Foot Custom Made Cable.